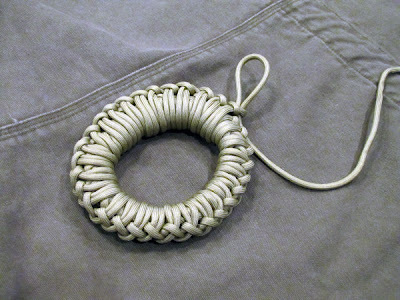 While not the quickest to make, a paracord donut is a handy way to carry a large amount of paracord in a compact package. Nothing to get tangled, so these ride pretty well in a bag. If you need to use the paracord, just pull the end to undo the braid. 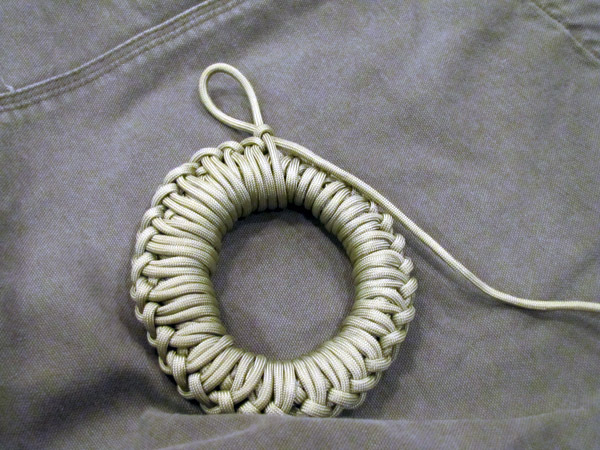 The pictured donut has about 40 feet worth of cordage in it. 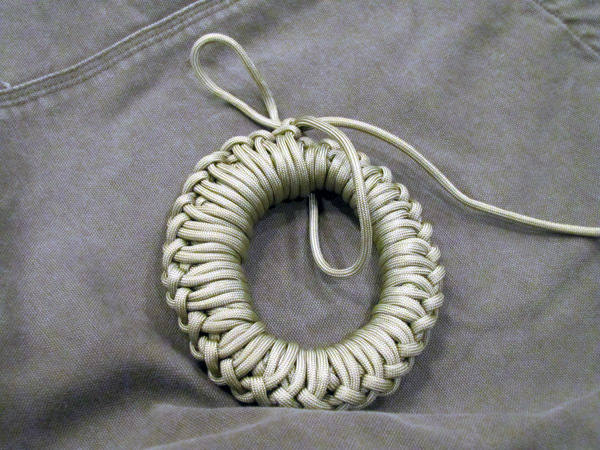 Took about an hour to weave, but it was my first time makin' one. Making the paracord donut is fairly simple, once you get the basic braid down. Just repeat over and over again. Step-by-step after the jump, or do a YouTube search for a slew of how-to's. 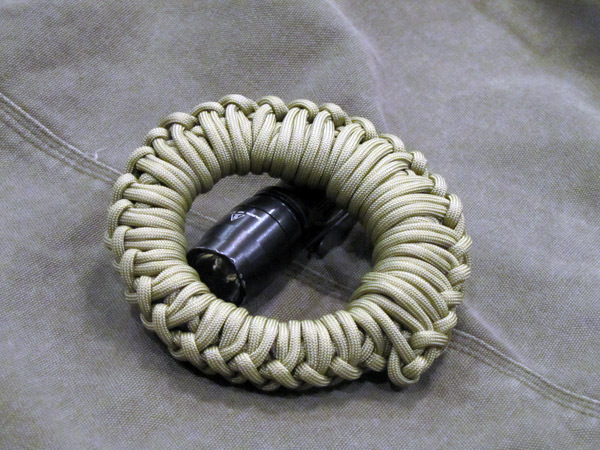 Start out with a few loops of paracord. There's no specific diameter that you need. This will form the core of your donut--the smaller the diameter, the fatter the donut. Next, you'll want to make a loop with the long/tag end. This part is a bit tricky. 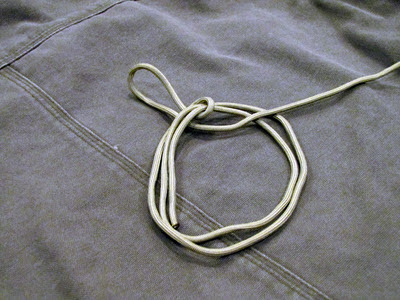 You want to pass loop #2 through the middle of the donut and around your cordage center, then up through loop #1. 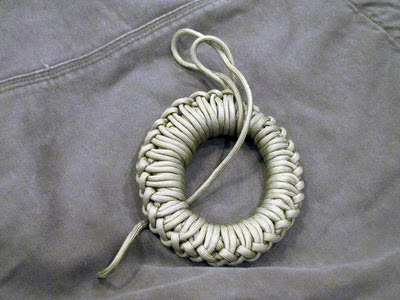 Then you start on the braid. It's a bit hard to see for the first braids and generally requires a bit of hands on to hold it together while the braid is really tightening/forming. 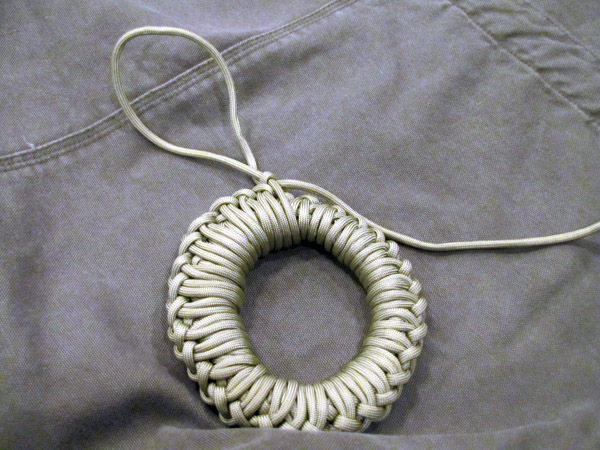 The next pictures come from an almost complete donut. It's the same braid all throughout, and it's easier to see how the braid works at this point. 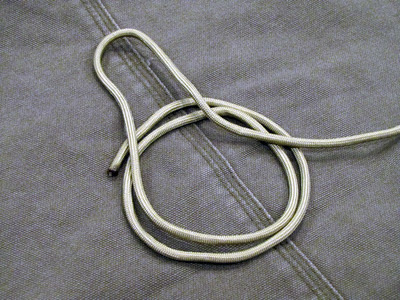 All right, here's your loop #1, same loop as we left off on the last set of photos. And we're going to be continue working with the tag end. Make a loop #2 and wrap it AROUND the body of the donut. Through the donut hole and then up through your loop #1. 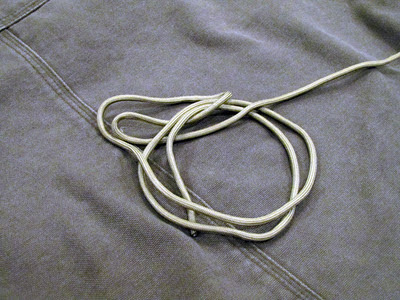 Then it's a matter of tightening things down. Pull on the last inside-the-donut wrap and cinch loop #1 tight. Loop #1 is tightened down, moving the excess cordage to the inside of the donut. 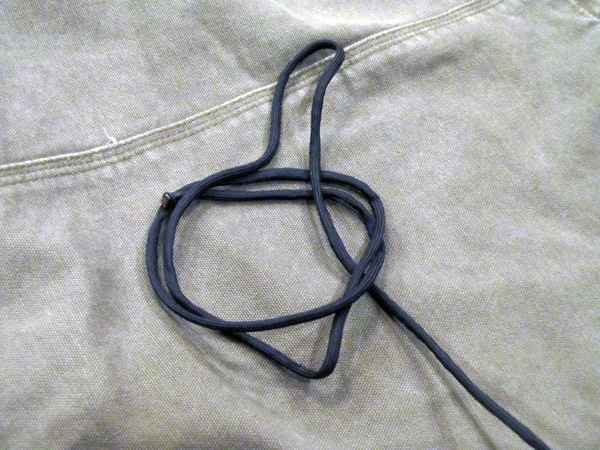 Pull on loop #2 to tighten this up. 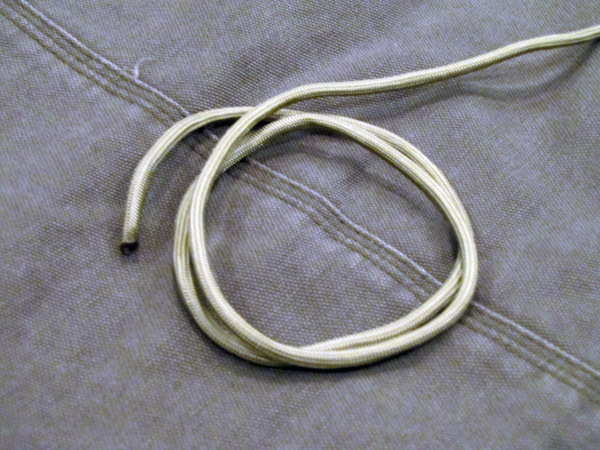 And finally pull your tag end to shrink down the loop to a manageable size. 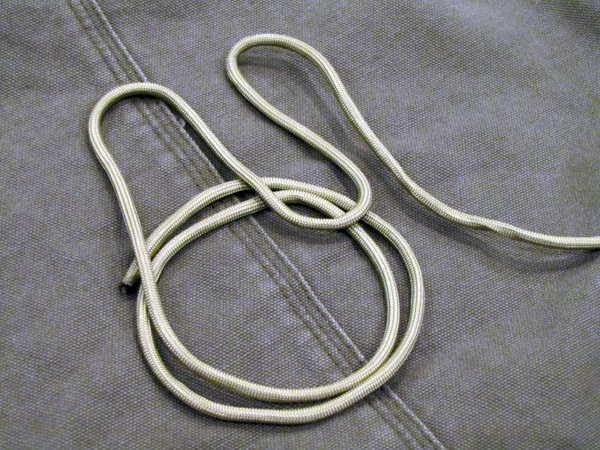 That's one braid; repeat until you run out of cordage and your loop is done! If my completely awesome photo tutorial wasn't enough, this is one of the better YouTube instructionals I've seen.